My team and I knew we wanted to tell a story in virtual reality. But the VR experiences, VR games, and VR documentaries we’d seen so far were successful sensory experiences but mostly unsuccessful dramatic experiences. They weren’t great stories. They didn’t move us. We wanted to tell a great story in VR, not create a VR experience with a story. One of my team’s earliest influences was “Dear Angelica”, an animated, linear, narrative short film with beautiful art work, a rich dream world, and a moving story. The first person, audio narration, helped overcome the abstraction of impressionistic, animated-VR but was bolstered and enhanced by the immersion and interactivity of virtual reality. The dramatic impact this produced was even greater than if the story had been merely an animated short film. It was also substantially different from a live action dream sequence. It was a new experience, a different kind of story. It was a VR Film. Animated VR or 360 Video? From the beginning my team wanted to build an animated VR experience. We feel animated VR is where the magic is. 360 Video has a lot of potential for journalism and straight documentary, but for our dramatic purposes it had storytelling limitations. The dramatic moments in 360 VR seem to rely on transporting you to a new place and exploiting the drama of a few photographed moments. We wanted to create drama through an overarching story where we had much more control of the narrative. The challenge with animated VR is that photorealistic animation is too development intensive, expensive, and often has “uncanny valley” problems. Our team has sought out tools to make prototyping more efficient and find places for photorealism in our story. But we decided impressionistic, animated VR would be our main approach. Write an original story or adapt a story? My team and I are experienced writers and filmmakers and so we all had ideas for original short fiction/screenplays that we could adapt to a VR Film. But the more we went over them and started imagining their treatment in VR, the more they felt like dramatic video games or interactive, animated short films. Stories we’d have to write extremely well and translate to VR with lots of detail to succeed at. In short, original short stories seemed budget and execution dependent. So then we considered adapting true stories. Where do we find influences and case studies? These early VR Films and examples of immersive theater storytelling provided a lot of answers in our search for the right balance of the myriad storytelling elements we wanted to use in our VR Film. Do we tell a story with choices? In addition to immersion, VR provides the opportunity to leverage interactivity for dramatic effect. The implicit immersion of VR simulation only adds to the drama (Once you get past technical issues like headset fatigue, motion sickness). But interactivity, at the story level, can create dramatic challenges. As every game designer knows, the more story choices, the more narrative branches, the more ‘choose your own adventures’ you have to build. On the other hand, a fully linear, non-interactive story would miss the opportunity to use the tools of VR to immerse our audience fully and tell deeper, more personalized versions of our story. A bigger challenge we found with creating story choices is that great dramatic storytelling really requires timing. Dramatic storytelling requires a careful manipulation of the tempo of the story, of your audience’s attention, and even their eye line. The succinct set up of information with a timely payoff; a well architected posing of questions and clever ways of answering them in the right amount of time. In a VR Film, the non-linearity of story and openness of the world, threaten to defuse the emotional power of a narrative and its structure as a whole. So we looked at our influences and other successful VR experiences to see how they dealt with the balance of story and interactivity. In the end, we determined that for emotionally relevant, cathartic storytelling, it is the immersion of VR that is most important. We would include some simple, manual, interactivity to foster immersion but not employ narrative choices that would dampen it. For this project, we decided on a combination of well guided interactive moments in the scenes that obey a single, overarching, linear narrative. We did incorporate the concept of customizing your heritage by adding your own food, music, and clothing to the story would allow our users to interact with the theme and story of the VR film. How do you adapt a true story to VR? Using the paradigm from Notes on Blindness: Into Darkness, we started looking for true, audio stories to adapt. And as soon as I thought about adapting true stories, I immediately thought of The Moth. I’ve been to Moth story slams in NYC and I’ve known them to be a magnanimous organization dedicated to the craft of story. Great storytelling, short stories (8-15m), both dramatic and poetic. But would they adapt well to VR? My team and I jumped on their website and listened to dozens of Moth stories. True stories all, told by the persons they happened to, some dramatic and comedic, all short form, all well crafted, well edited and compelling. We whittled it down to a short list, debated the merits of several amazing Moth stories, discussed preliminary ideas on how we might treat them in VR. Thinking about translating so many different stories to VR as I listened to them was illuminating. It helped me define the “criteria for a VR Film”. Not just for our project, but for all VR storytelling. What kind of story demands VR? For us, the bar for a successful VR Film was not just a successful adaptation, but to create a storytelling experience that exceeds the original. 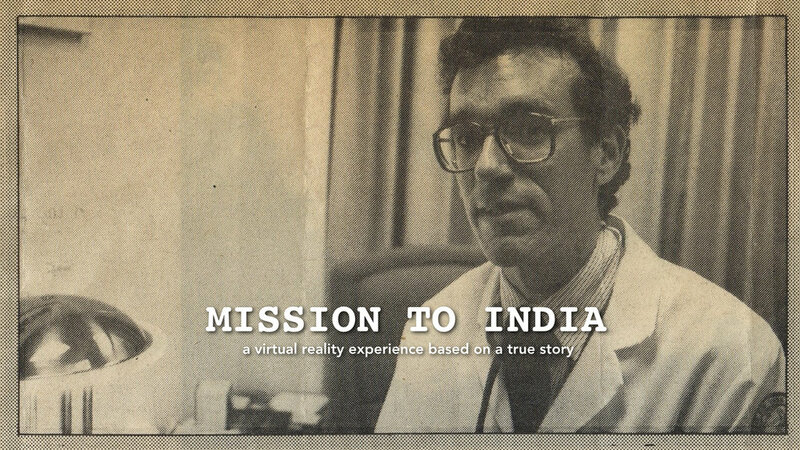 Finally, we chose “Mission To India” by George Lombardi. This astounding tale fit our VR storytelling criteria and was a story my team was ecstatic to tell.